Title: Dell Four Color. 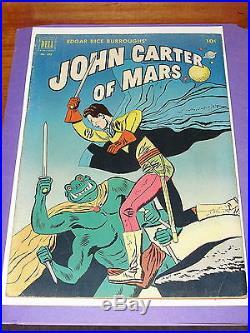 John Carter of Mars. (Origin – Jesse Marsh cover and interior art). Condition: Nice solid, clean, complete copy. Very light edge and corner wear. Cover and centerfold are firmly attached. Other wear is consistent with grade. View the pics to help you with judging the grade. Don’t Let this one slip by! If multiple comics/items are shown – they are in separate listings. Scans/Photos of the actual items are shown. Condition should also be considered by viewing the photos. Be the only’kid’ on the block to have this one. Would look excellent in your collection. These are getting harder to find. You can check the antique shoppes, flea markets & shows. If you really want it, I’ll send it from my collection to yours for the price listed. Looking for something to enhance your collection? Trying to find that gift for a family member or close friend? I’ll always be listing new Items weekly. Cards, books, comics, mags, music, older and newer releases, etc… Listing are sometimes a little less descriptive than what I usually do in order to get more posted – Please ask if you have any questions. Many great and interesting items will be listed. Feel free to negotiate – I’ll entertain any reasonable offer. I treat everyone fairly and my feedback shows that. Special requests, wish lists and all inquiries will be answered to the best of my ability. I may not an absolute expert on anything, but Im pretty knowledgeable about a lot of things. Further with the Federal closing of smaller post offices (mine included), it might take a couple extra days to arrive. If you need it quickly, just ask and I usually have no problem accommodating your wishes. Unless you are local and can pick the item up. There are other arrangements that can be made if necessary feel free to ask. Happy Hunting and Thank You for your time looking at my trinkets! The free listing tool. The item “Comic Dell Four Color #375 JOHN CARTER of MARS 1952 Jesse Marsh art Origin ERB” is in sale since Saturday, June 20, 2015. 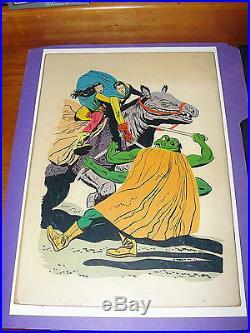 This item is in the category “Collectibles\Comics\Golden Age (1938-55)\Horror & Sci-Fi”. The seller is “pack-ratz” and is located in Reading, Pennsylvania. This item can be shipped worldwide.